A lot of tax discussion recently has focused on foreign exchange rates and border adjustments. Rather than talk about difficult abstractions, I thought it might be helpful to think about things in terms of a real physical business and its real physical outputs. What follows, I hope, will help show how real businesses that do international trade interact with each other, and how that all relates to recent policy proposals. Suppose that I am in the furniture business. Suppose my business mostly controls the entire production process, starting with the forests and ending with final sales of furniture. My main purpose is to turn forests into timber, timber into boards, boards into furniture, and furniture into dollars. The only output I really want from my business in the end is dollars, because that’s what I use to pay myself and my workers. However, at one point in its chain of production, my business gives me an output I can’t really use: pulpwood. That’s the leftover stuff that doesn’t make for high-quality boards or good furniture. I also can’t pay my workers in it. So instead, I set up an exchange with a box factory: I send pulpwood to the box factory, and the box factory sends me dollars. Now I can use those dollars to pay myself and my workers. In this example, it’s fairly obvious that I should care deeply about the fate of the box industry. The box industry is essentially a part of my own chain of production; they’re the people who know how to turn pulpwood into dollars effectively. I don’t oversee this part of the chain of production, but it is nonetheless necessary to my business model. If the box industry became less profitable, it might not send me as many dollars for pulpwood as it did before, and that would harm the profitability of my own company too. 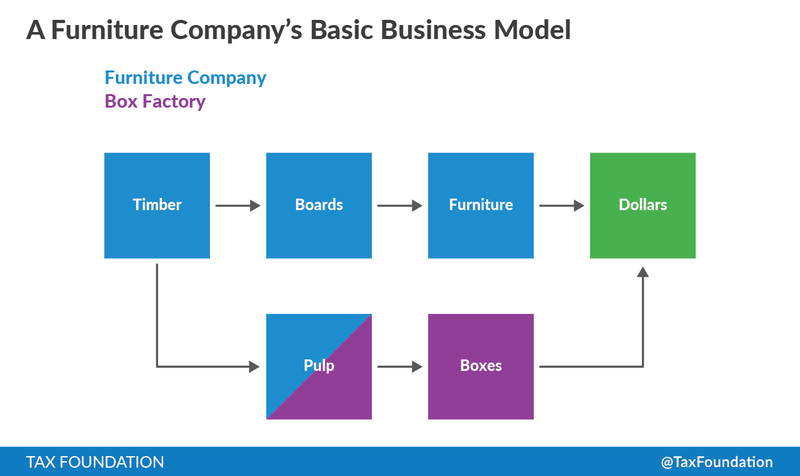 Pictured, below, is the business model so far. In blue is the part of the production line, and in purple is the additional portion done by my business partner, the box factory. This is straightforward story so far; I’m not trying to introduce any tricks. But now, let’s imagine one more step. Imagine that my furniture becomes popular in France, so I start making sales over there. Now I have another output I can’t really use: euros. The euros don’t help me build anything, and I can’t pay workers with them. So instead, I set up an exchange of euros for dollars, which I can use. I probably do this through a financial institution, but the financial institution is just an intermediary. Obviously, the financial institution doesn’t just perpetually accumulate my euros and hemorrhage dollars. Instead, it looks to find someone willing to pay dollars for my euros, so that it can balance its books. The financial institution finds a French winery that has plenty of sales in the United States. We could talk at length about this winery, but there’s no need. From our perspective, what matters is that the winery is a kind of machine that turns euros into dollars. 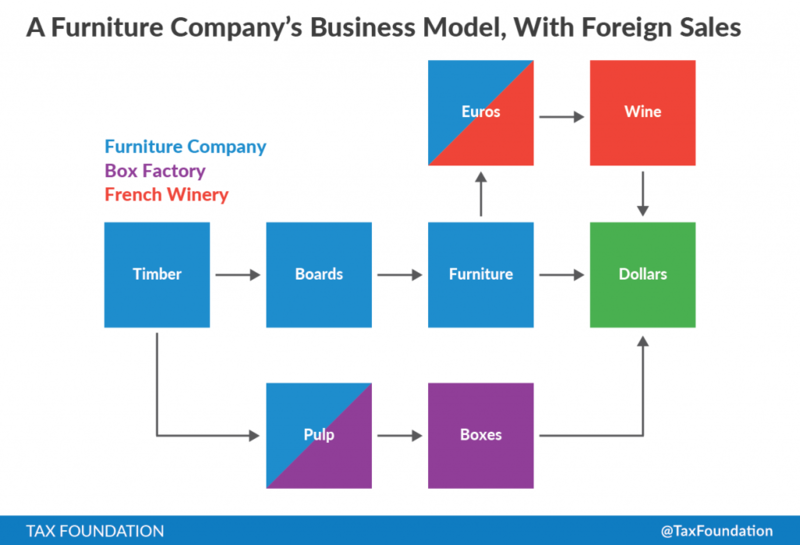 It does this by giving Euros to French workers, who grow grapes and turn them into wine, and then it sells that wine to American wine-lovers in exchange for dollars. Its own ultimate goal is to collect euros, so it happily goes to the same bank as me and gives the bank dollars in exchange for euros. I should care about the French winery just as I care about the box factory. The French winery is needed to help turn my euros into dollars, just as the box factory is needed to turn my pulpwood into dollars. In effect, both of these businesses are just essentially components of my own chain of production, each independently turning something I can’t use into dollars that I can use. If either one became less profitable, it may offer me fewer dollars in order to make ends meet. In turn, these businesses probably care about me; they’d be upset if I became less profitable, because I’m actually a part of their chain of production too. Now, how does this all relate to the big conversation going on about border adjustments in the House GOP plan? 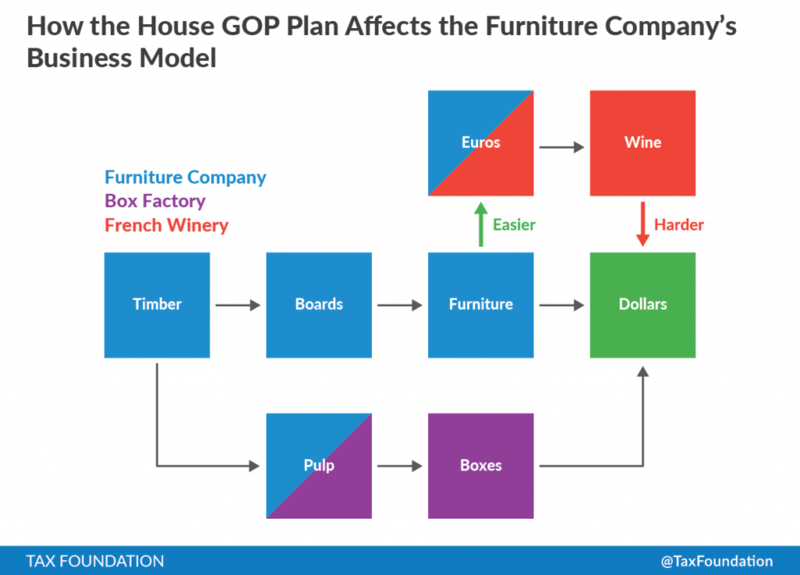 Well, the House GOP plan’s border adjustments makes the step where furniture is turned into euros easier. Simultaneously, though, it makes the step where the French wine is turned into dollars harder. It does this because it excludes exports (like my furniture) from taxable income, but includes imports (like the French wine) in the tax base. From the diagram above, you can see that border adjustment both helps and harms the overall business model. It makes it easy for me to acquire euros, but it makes it hard for my counterparty, the winery, to turn that wine back into dollars. The winery gets fewer dollars out of each euro of wages it pays to its workers, because all of its sales made in dollars end up paying the border-adjusted tax that it didn’t have to pay before. The winery, therefore, is willing to give me fewer dollars per euro than it did before. I’m not too pleased with this, because it takes away the apparent windfall I got from the policy change. But the fact is that I don’t want euros, I want dollars. And my way of turning my euros into dollars is to cut a deal, through my bank, with the French winery. I tell my bank to find a different counterparty, but they tell me that everyone else who turns euros into dollars has the exact same problem as the French winery. The way they always got dollars is by sending their goods to the United States, but they have to pay the new tax. I grudgingly accept the new exchange rate of fewer dollars per euro. After all, I can afford it, because I’m making many more euros than before on my furniture sold abroad. As an exporter, I am excited about the tax change, but unhappy about the sudden ineffectiveness of my euros-to-dollars converter. Across the Atlantic, there’s a winery that is very upset with the tax change, but happy about the sudden increased effectiveness of its dollars-to-euros converter. I’m spending so many words on this example not just because it’s germane to policy discussion right now, but also because it’s a broad lesson economists try to teach about all kinds of tax policy. Taxes are paid by specific people or businesses, but their impact is felt more broadly, by everyone they’re connected to. The border adjustment provision of the House Republican plan is a great example of a policy where the nominal burden of the tax changes quite a lot, but the economic burden changes very little. Every single international business model has a component that will get easier, and a component that gets harder. The real world is substantially more complex than this example allows for, but its central lesson holds. Another lesson to be learned from this model is that policy ideas based around changing the trade balance don’t really make much sense. 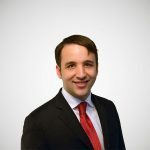 Every U.S. exporter has a part of their business model that involves changing foreign currencies into dollars, and the way for them to do that is to have an importer on the other side of the transaction. Foreign exchange markets are typically not something that most individuals pay attention to. However, in the current policy environment, which has focused a great deal on trade, it is worthwhile to begin thinking about how they work.